Whenever the topic of "Helicopter Moms" comes up, I find myself growing increasingly uncomfortable. It's trendy these days to sneer at the Helicopter Mom. Over the past year I've heard a number of examples given of Helicopter Moms. It can include everything from hovering over your child as they toddle around the playground to believing that they have a food intolerance or allergy and preparing meals that don't include the thing that makes them sick (I'm not even kidding. That example of "helicopter parenting" has been given here on this blog in the comment section in the past.). The thing is, I know that from the outside looking in I absolutely, far more often than not, would answer "hey that's me" to those questions that would cause one to fail the imaginary helicopter-litmus-test that I see being flung here and there and everywhere. Going to the park is a two person job in our family. I haven't done it on my own since... well... two children ago. When Sadie was three and Maggie was one, and not so very fast or steady, I could do it. I could be everywhere at once, hovering and making sure everyone was safe. I put them in their little red wagon and pulled them to the water park near our home or unleashed them on the almost always empty playground near the law school at Ave Maria and for the most part we were fine. We only had to go to the ER once. But now it requires a team effort. We need more than one parent helicoptering around after these small, quick, darting children to make sure that they stay safe. And failing to be vigilant enough, quick enough, everywhere at once? That's one of my greatest fears. Because I don't just have to be a helicopter parent. I have to be one of the very best helicopter parents. I need to be a Super-Ultra-Helicopter Mom to make sure that Maggie stays safe. The funny thing is that in some ways, in a controlled environment where there's nothing that can mortally injure a certain daring four year old, I'm pretty laid back. 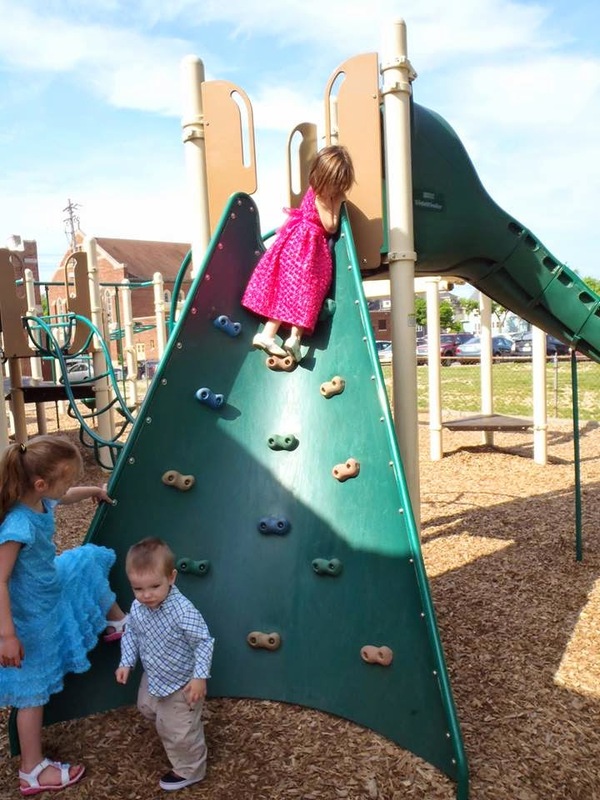 In our yard or at a totally enclosed playground, I can sit and watch her climb way too high on the playground equipment and be totally at ease. I've been watching her climb since shortly after she learned how to walk (she walked across the room on her first birthday... so it's been a while) and she doesn't fall. So when she's climbing I tend not to hover as closely. The thing is even when she's climbing I need to make sure she's not going to suddenly jump down and take off at a sprint. So, while I might relax a tiny bit, I still tend to hover. And when I'm tired, Paul hovers. We take turns. It's exhausting. 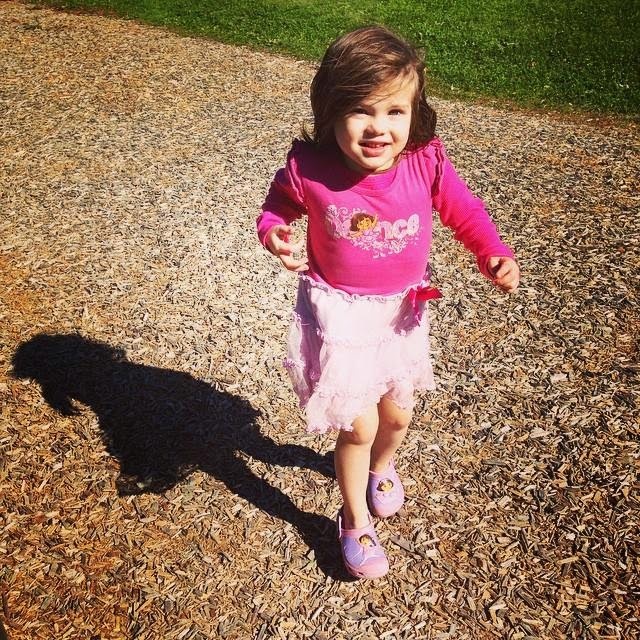 Sometimes other parents look at me like I'm crazy, running after this not-so-small child, making sure she's never more than an arms length away, and I can see in their expressions that obviously I'm that helicopter mom that everyone on the blogs feels so morally superior to and writes so sneeringly about. I'm That Mom. The one they're talking about in those articles everyone shares on Facebook. As if the hovering isn't bad enough we have the food allergies too. My diaper bag has a pocket for the inhaler with the spacer and face mask, two epi-pens and a generous supply of Benadryl melts that come with me everywhere I go. And you might see me fling myself on top of a pretzel like I'm protecting her from a live grenade if she happens to come across one that's been dropped at the playground... because I've seen what happens if she eats it and I don't want to live that again. Not infrequently my friends share those posts that basically describe the Helicopter Mom as a blight upon western civilization. 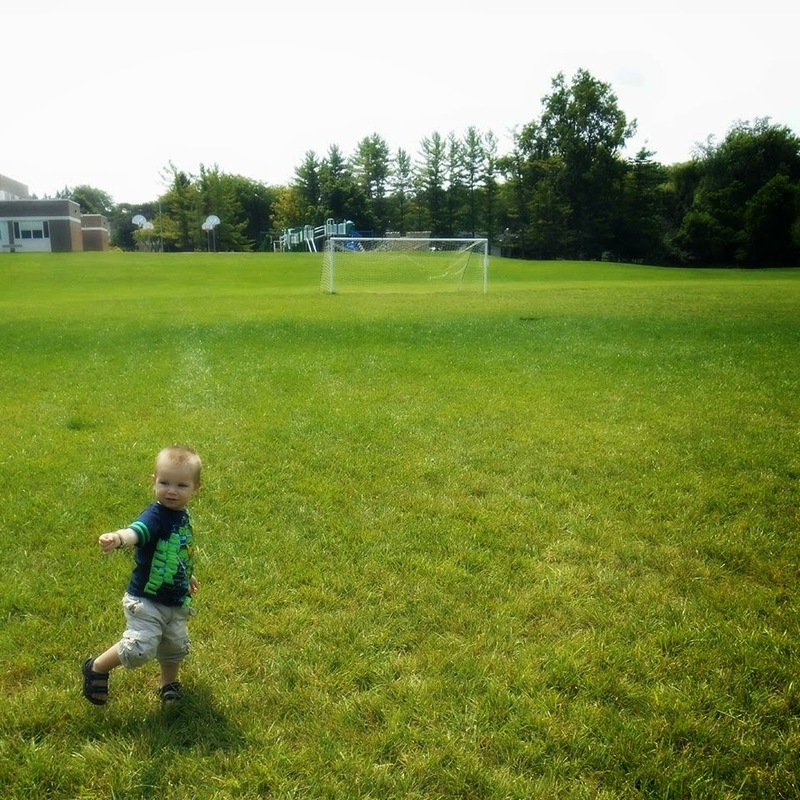 Usually the author of said article gushes about the superiority of Free Range Parenting. And it kind of feels like a punch in the gut. I never finish those articles that talk about how much better off my kids would be if I just stepped back and relaxed. I don't comment and say that relaxing is a luxury, that for some of us the stakes are too high and turning away, glancing in the wrong direction for a second too long could be deadly. 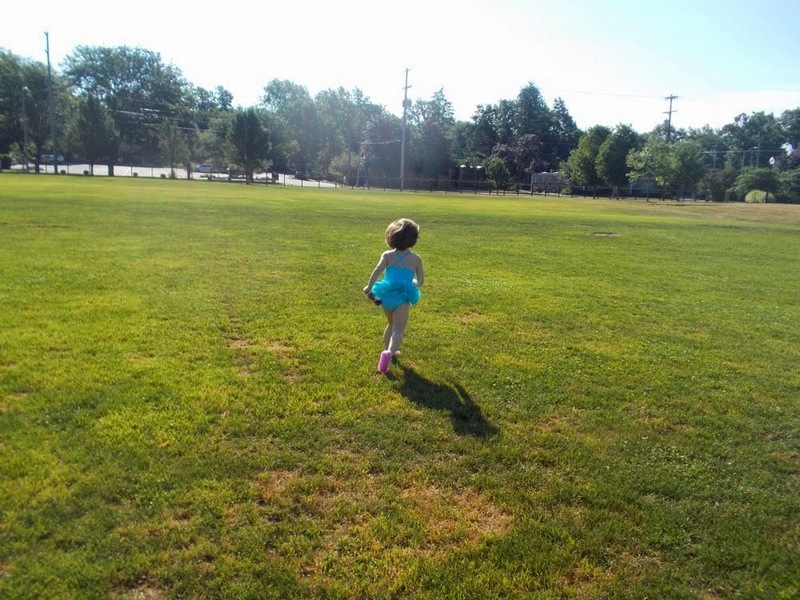 I don't point out that when you have a child who runs and runs and runs just to fill that need to fly across the ground, thinking of nothing else, then you innately understand that it's a luxury you can never allow yourself. Because you know that that child doesn't understand that a moving car is dangerous, or that she won't swim like a mermaid if she plunges into that river, or runs straight into the path of that big kid swinging as high as he can on the swing. I'm sure that someone will comment and say that "it's different." That "most helicopter parents don't have those reasons that you're talking about. They're just being overprotective." I feel like the Mommy Wars, in general, are becoming less popular. A lot of parents have realized how ridiculous it sounds to insist that there's only one way to parent, only one right answer, on most issues at least. But the same people who would likely agree that brow beating someone for giving their child a pacifier is absurd, still wouldn't think twice about rolling their eyes about the Helicopter Mom who doesn't let their child out of their sight. If you do find yourself watching "Helicopter Moms" with disdain when your at the park, or the zoo or just walking down the street, then maybe you could do me a favor. The next time you see a mom hovering, staying close to their child, helping them do something that you assume that child should be able to do on their own at "their age," maybe take a step back and give that mom a break. Not all disabilities are obvious. And even if the child doesn't have a disability, do we really need to fall back into yet another round of "my way is better than your way." Isn't that what we'd all like to get away from? Whether you're a Free range or Helicopter, or whether you find yourself somewhere on the vast expanse in between, I think we can hopefully agree that most moms are just doing the best they can keeping their kids safe and healthy. And maybe, just maybe, this is one more subject in the aptly named Mommy Wars that we can put to bed. HUGS!! You are a great mama! I don't think making sure your child is safe is helicopter parenting. People need to worry about themselves and their own children more than everyone else. Thanks Verna. I think you summed up in the last sentence of your comment a big part about what bothers me the most when I see these posts slamming different parenting choices.. different things work for different people and if people worried more about their own choices in these small matters and less about others the world would be a kinder place. Love love love. This is great, Cammie! I tend to hover for my kids' safety, too. I let them do things on their own, but I need to stay close to keep them safe. 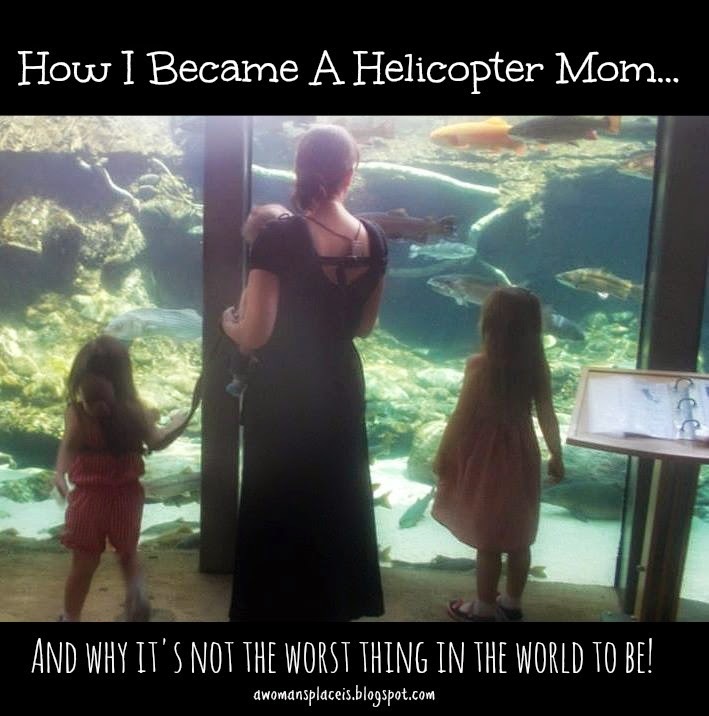 I get uncomfortable when people post articles scoffing at "helicopter moms," because I'm sure many of them would consider me a "helicopter mom." The Mommy Wars are ridiculous, and as my kids get older, I start to become more and more detached from it all, which is good. I notice most of the "Mommy Wars" soldiers are parents of very young children...they're not very seasoned parents yet, and their insecurities are surely driving their rash judgment of other moms! I'm so glad you wrote about this. I wish more Catholic moms would! Someone recently posted that you can tell who the STRONG women are (and I would add, virtuous): they're the ones building each other up instead of tearing each other down. So true! I love the quote in the past paragraph of your comment. And I think it ties in so well to the second paragraph because I think that in many ways your right. When we have less experience and are less sure of our choices I think sometimes we defend them all the more adamantly as if we're convincing ourselves! Sometimes I feel like the longer I'm a parent the less I know about having the "right answers." 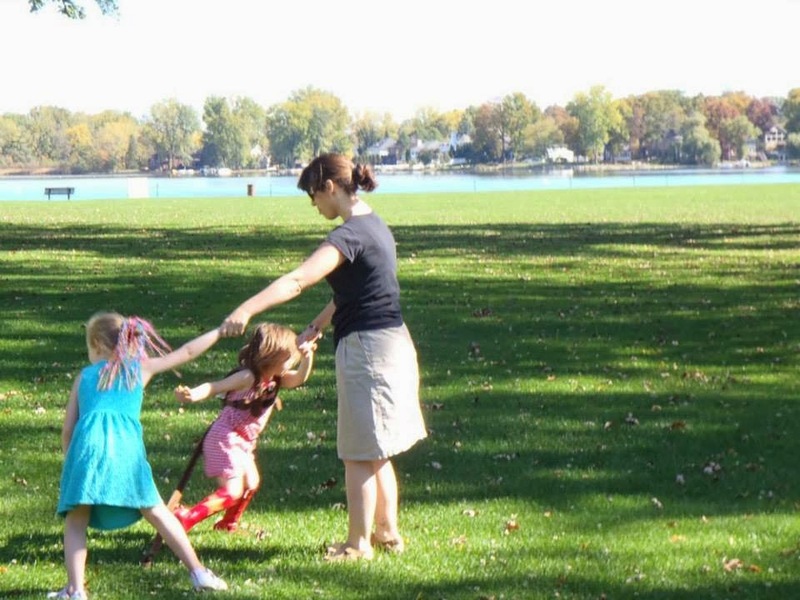 I think of helicopter parenting more about not giving kids age-appropriate freedom. For example, meddling in their school friendships, believing that no other home is an acceptable place for a playdate, overseeing homework to an extent that really the parent is doing most of the work, blaming And hassling teachers for their kids bad grades instead of making teens take responsibility, calling every single day when the kid goes to college... making sure your kid who has proven herself to be a risk-taker doesnt run into the road is just smart parenting! I am sure as she matures and grows, her freedoms will increase as appropriate! The college example totally reminds me of a parent asking who was going to wake her baseball player son up and get him to class during freshman orientation when I was in school! And I'm all for making sure that kids are responsible and can function on their own, and for parents not being rude and making sure they're kids respect authority. Unfortunately 100% of the time when I see an article or post on helicopter parents it's aimed at the parents of younger children and almost always takes aim at parents who appear to be over protective on the playground. Hi Jennifer! Thank you for sharing your perspective! I think perhaps one of the biggest problems I see when I see people writing about helicopter parenting is that they're making a lot of big assumptions about other parents, without really knowing the whole story. So I've seen other writers talk about some lady they saw at the park who was helping their child climb up steps that they were obviously too old to need help with, and the writer will disdainfully label that mom as a "helicopter mom" when it's very obvious that they don't know anything about the mom or child and what special challenges that child might face that aren't obvious. So I guess what I'm saying in a round about way is that what bothers me so much is that there seem to be so many people out there writing about these situations who don't seem to realize that what might be safe for their five year old, isn't necessarily safe for all five year olds. I totally agree that it's something different altogether to treat a college bound student the same way (and some examples from my own college orientation a decade and a half ago definitely come to mind! ),but unfortunately usually when I see the label being given it's being given to a parent of younger children who the author usually doesn't know all that well (or at all). I can't even imagine being a TA with parents like that! It'd be so hard to hold your tongue (for me at least!). And I definitely agree that parenting, all around, would be a shade less stressful if there weren't so many critics out there ready to tear apart both actual and perceived parenting choices. This is awesome, Cammie! Thanks for writing it!! I think by definition, helicopter moms are impeding the growth and development of their children. My mom used to say, "I'm not raising kids, I'm raising adults" - meaning that by the time we were 18, her job was supposed to be light background support at best! It was up to her to make sure we were up to par by then. Helicopter moms ultimately have a secret desire for their kids to lack independence, forever "being needed." I like that definition (and that would totally be the opposite of me, because I am very, very conscious that I need to do everything I can to help our kids be as independent as they can possibly be). I guess that means my main issue is maybe with the misuse of the term and how it's more commonly used when people are writing about how they encounter it around the preschool/younger elementary age set (or how they perceive it at least). Yeah, I mean I guess it can manifest at that age. I once had a mom call me in a huff because my 4-year-old called her son a "tooty head" at preschool. Well, this was my fourth son - I was glad he only said that! She was incredulous. I chalked it up it being her son's first exposure to school. Said I was sorry, then laughed to myself! She was a little dramatic and hellicoptery, but whatever. LOL! You're description of your son reminds me of Patch these days. He's become such a little bruiser since he's so used to rough housing with his sisters and being the little one is making him tough. I count it as a major act of self control right now when he only uses his voice when he's mad these days. Frankly, I think that those folks who call moms of young children who do their best to ensure their safety "helicopter moms" misunderstand completely what the term actually means. Several previous posters have already pointed out that it refers to parents who do their child's homework, fight all their battles, call or email professors (!!! ), serve as their college student's wake-up service, etc. Making sure your child doesn't run into the street or fall off a high fence is just good, vigilant parenting. I wish I'd actually seen it used in those ways! I totally believe you guys and I think it must be because I tend to read articles/blogs aimed at the preschool/younger set... and have friends that especially share those articles too! Sigh. I have no idea if my message went through, so I won't type a big long one out. I hate terms like "helicopter mom"... because the person who made that up is a mom who's hands off. Meanwhile, why can't we all just raise our children as we see fit. Thank you (and especially for taking the time to comment twice since blogger seems to have eaten the first one!). Blogger and it's comment section! They drive me a little bit nuts! And I'm in total agreement on the parenting as we see fit! What each individual child needs can be so vastly different that it's impossible to prescribe a one size fits all approach. I don't think "helicoptering" is at all inappropriate for younger children. It's what's needed to keep them safe, after all! Like others have said, I think of "helicoptering" as the parents who are still inappropriately involved in their older children's lives--going with them to job interviews, babying them in college, etc. I'd actually never seen it applied that way until this post! I think it must be because the articles and blogs I read are usually more geared towards the preschool and elementary set. It would make so much sense (of being spoken of the way it is) when applied to grown men and women being babied!